Nvidia landed an astounding blow to AMD last July pulling the GeForce GTX 460 out of nowhere and quickly taking the lead as the best mid-range graphics card on the market. It's only been a few weeks since and the 768MB version of this card can now be had for as little as $170, crushing the Radeon HD 5830, and questioning if the slightly cheaper Radeon HD 5770 is worth the money. The GeForce GTS 450 is based on Fermi's third-generation Streaming Multiprocessor architecture. The graphics processor boasts 192 CUDA cores, the same shader power of the GT200 architecture used by the GeForce GTX 260 and thus, 43% fewer cores when compared to the GeForce GTX 460. The GeForce GTS 450 features 32 TMUs (Texture Mapping Units), again 43% less than the GeForce GTX 460 and half than the older GeForce GTX 260. The 16 ROPs (Raster Operations Pipelines) on the GTS 450 are 33% less than the 768MB version of the GTX 460 and 50% less than the 1GB version. The GTS 450's clock speed for fixed function units is 783MHz, while the CUDA cores operate at a more aggressive 1566MHz. These frequencies are the highest of any GeForce 400 series graphics cards available, though it's not uncommon for the budget cards to receive frequency boosts as it's cheaper to make a less complex GPU and simply overclock it. The GeForce GTS 450 is said to become available in both 1GB and 2GB capacities, though we believe most cards will stick to the 1GB memory buffer. The memory is clocked at 900MHz (3600MHz DDR). Regardless of memory capacity the bandwidth will be limited to just 57.6GB/s due to the implementation of a 128-bit bus. At least on paper for now we learn that the Thermal Design Power rating of the GeForce GTS 450 is very reasonable compared to previous GeForce models based on the Fermi architecture. Whereas the TDP of the GeForce GTX 460 (1GB) is 160 watts, the GeForce GTS 450 has received an even lower rating of 106 watts. The GeForce GTS 450 draws in power from the PCI Express slot and from a single external PCI Express power connector. The GTS 450 requires one 6-pin connector, which is the same configuration used by the Radeon HD 5770. The GeForce GTS 450 also features a single SLI bridge connector allowing it to be paired with another graphics card for 2-way SLI which we will be testing in this review. For testing Aliens vs. Predator we used the highly demanding custom DX11 benchmark. We played through a test scene in the same sequence every time for accurate results. The maximum possible visual quality settings were enabled along with 4xAA/16xAF. The standard GeForce GTS 450 averaged 21fps at 1680x1050 making it a single frame faster than the Radeon HD 5750 and 2fps slower than the Radeon HD 5770. The overclocked Palit GTS 450 averaged 24fps, or a single frame faster than the stock Radeon HD 5770. When compared to more expensive graphics cards such as the Radeon HD 5830 and GeForce GTX 460, the GeForce GTS 450 was 28% slower while the overclocked Palit version was 17% slower. Adding a second card for SLI mode saw the average frame rate increase by 86% from 21fps to a much more impressive 39fps. Paring two GeForce GTS 450 SLI cards provided greater performance than a single Radeon HD 5850 or GeForce GTX 470 graphics card. 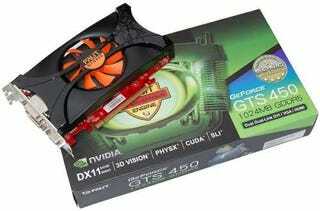 The GeForce GTS 450 SLI configuration was still 9% slower than the Radeon HD 5770 Crossfire duo however. For testing with Mass Effect 2 we relied on Fraps, recording 60 seconds of gameplay from the level Lazarus Research Station. Best in-game visual quality settings with 4xAA/16xAF enabled were used. When testing with Mass Effect 2 at 1680x1050 we found that the non-overclocked GeForce GTS 450 was 2fps slower than the Radeon HD 5750 and 8fps slower than the Radeon HD 5770 which worked out to be a 15% margin. The overclocked Palit GTS 450 Sonic Platinum card fared better with an average of 51fps making it 13% faster than the standard card. This performance boost was not enough to defeat the stock clocked Radeon HD 5770. However, thanks to the superior scaling of SLI the GTS 450 SLI graphics cards saw a healthy performance boost as the frame rate was increased by 98% when adding in a second card. This allowed the GeForce GTS 450 SLI configuration to beat the Radeon HD 5770 Crossfire cards by a 7% margin, and divide honors with the single Radeon HD 5870. Republished with permission from TechSpot.com. Steven Walton is the chief hardware editor at TechSpot; he also runs his own review site Legion Hardware. TechSpot is a computer technology publication serving PC enthusiasts, gamers and IT pros since 1998.